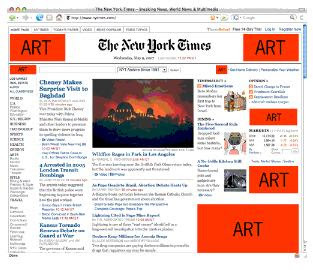 Add-Art is a plug-in for the Firefox web browser which, quite simply, replaces online advertisements with art. It's a neat idea - swapping out mind-numbing consumerism for high culture - even though it would be a bit disruptive if adopted en masse (and wrecked the effectiveness of online advertising). One more comment: I looked at the art collections that have been used to replace ads, and something struck me... They don't look that much different from ads. Pretty much any "art" image could conceivably be an ad - and come to think of it, many ads out there are visually compelling, interesting pieces of art. Maybe I'm jaded, but the line between the two seems fairly blurred!